You will need at least a week from Dali - add another two days if traveling to and from Kunming. No English is spoken (I met only one English speaker in my week in the valley). Expect the unexpected - power outages, landslide-blocked roads and other road closures, inclement and unseasonably cold weather - and prepare accordingly. Bring plenty of cash - no ATMs will work with foreign cards in the valley beyond Liuku. If you get car sick, reconsider - the bus rides along the valley are bumpy, winding, and - frankly - frightening. It’s not all picture-perfect: the valley is a major construction site, as authorities are trying to turn it into the ‘New Tibet Highway’ linking Yunnan and Tibet. Expect beautiful mountain vistas juxtaposed by construction sites, concrete trucks and bobcats. Expect regular passport checks, and detailed questions from police regarding your itinerary (being so close to Tibet, there is a significant police presence throughout the valley, and particularly in Bingzhongluo). It can be expensive: there are no backpacker options that I could find until Bingzhongluo and Dimaluo. Though Liuku, Fugong and Gongshan have some cheaper hotels, for between US$20-50, if you ask around. Getting around is pretty straightforward - but you have to be patient: buses only depart when full. Between smaller villages you’ll have to hitchhike or walk. “The last frontier in Yunnan tourism” one Chinese travel site describes the Nujiang Valley. The 300 kilometre, 4000 meter deep valley that runs from the Chinese towns of Liuku to Bingzhongluo along the Nujiang River is truly a final frontier in China. The Nujiang Valley (and the Nujiang Lisu Autonomous Prefecture that spans it) lies on the border of Myanmar, China and Tibet. It is a multicultural, multi-faith valley, harmoniously co-inhabited by Tibetans, Lisu, Nu and Drugong ethnic communities, as well as an increasing number of Han Chinese. Here, the hammer and sickle, Tibetan prayer flags and effigies of Jesus Christ sit side by side. The Nujiang River itself has a wild, powerful presence on the landscape. Its rapids are a constant on the long, windy drive from the Valley’s beginning to its end. I first saw the Nujiang River on a map, and was determined to get there. But I was stunned at how little information there was about how to travel and what to see. Much of this is because the valley is only now being developed into a viable tourist destination: hotels and hostels are being built, hiking paths are being carved into the mountains, and the roads are being constantly fixed, with the tourist scene catered predominately for domestic Chinese tourism. The Nujiang Valley is home to some of the most stunning scenery in China, and is the starting point for some of China’s most adventurous trekking routes. 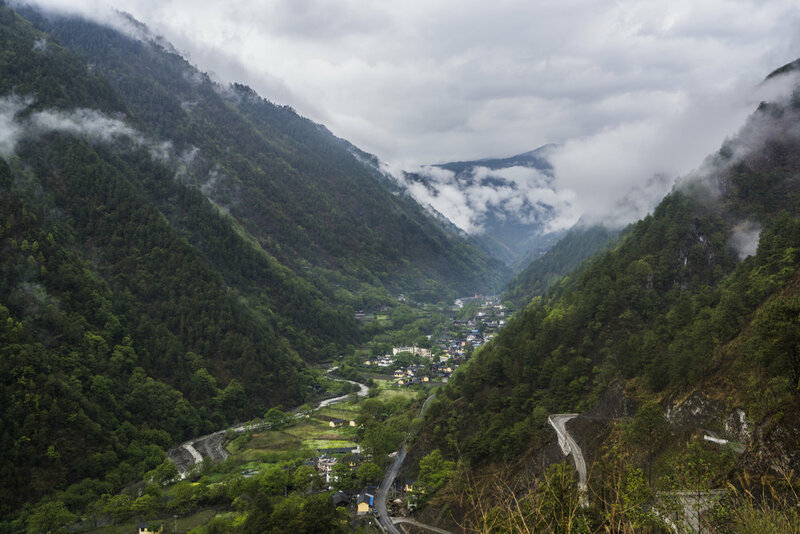 The towns of Bingzhongluo and Dimaluo, deep in the valley, provide the best staging grounds for serious trekkers and day-hikers alike, as well as being interesting (if quiet) in their own right. Considering solo travellers can’t explore Tibet, the Nujiang is a pretty close alternative: the majority of its population is Tibetan, and Bingzhonglou is just a few kilometres away from the Tibetan border. For a taste of Tibet without smuggling yourself into the province illegally, or paying thousands for a group tour, the Nujiang Vlalley might be your best bet. It’s also a fun challenge: you won’t see another Westerner, and will be in a part of China that barely any Chinese even get to see. From Dali, buses run every 40 minutes to Liuku (100yuan), the major city at the start of the valley. Direct buses also run to Fugong (128 YUAN), which is about 5 hours further into the valley from Liuku. Once in Fugong, it is very easy to catch buses to Gongshan and Bingzongluo - the two major towns in the northern half of the valley. Simply walk to the bus station and negotiate with one of the dozens of minibus operators who park out the front. The local buses cost around 20 yuan each trip, but are infrequent. A more expensive, but more efficient, option, is the endless array of minibuses that will offer rides between the towns. I only caught one, from Fugong to Gonsghan - a 10 hour ride - which cost 80 yuan. Bare in mind, the distances look small, but the travel times are onerous. My trip from Dali to Fugong (300 kilometers) was scheduled to be 7 hours and took 13. Fugong to Gongshan, just 100 kilometers, was a 10 hour drive. Gongshan to Bingzhongluo, 42 kilometers, took 4 hours. As much of the road is under construction (as of April, 2018), speed limits are between 5 and 20 k/ph, with constant delays due to the road narrowing to one-way passes. Even if you have your own car, expect delays. For those wanting to see wild scenery and small, relatively traditional villages, it’s worth making the effort to spend your time in the valley in Bingzhongluo and Dimaluo. You will need to stay at either Liuku, Fugong or Gongshan en route from Dali or Kunming (I was forced to stay overnight in both Fugong and Gongshan before finally making it to Bingzhongluo). Liuku and Fugong feel like normal, if small, Chinese cities, with not so much beautiful scenery. Gongshan is a prettier, smaller town - my one night there was enjoyable enough - but I wouldn’t intentionally stay there. Hiking trails are largely closed from November to early April. Major trekking routes - ones into the neighbouring Mekong Valley and the city of Deqin, as well as other routes into Tibet - only open in May. But the summer is also the rainy season: so bare in mind that while June, July and August will be warmer, they will also be wetter. The more rain, the more likelihood of landslides on the main road in, which, apart from being dangerous, will also cause significant delays. Bingzhongluo and Dimaluo are the only two towns in the valley with hostels/homestays that I could find that are actually affordable. Bingzhongluo has two options - both for 35 yuan a night (US$6) for a basic dorm room. The first choice is Aluo’s Backpackers Hostel. After exiting the bus, walk up the main road in Bingzhongluo until you see the only t-junction. Turn right (to the east), and about 40 meters down the road lies Aluo’s. You can’t miss it: its a big pink building on the northern side of the road with ‘Backpackers’ written all over it. Aluo’s has 12 dorm beds over three rooms, and several other private options. It also offers trekking maps, good wifi, and drinking water. The second option is the Goodlife Inn, on the eastern side of the only road that runs through Bingzhongluo. It has a small cafe / bar at the front, and one dorm room with four beds, as well as more expensive private rooms. Note - this room will often book out, particularly in peak season. Dimaluo is a tiny village with only one accommodation option: Aluo’s Guesthouse (yes, its also called Aluo’s). Aluo’s Guesthouse is run by the only English speaker in the valley (Aluo), and is situated on the main road, just slightly beyond the centre of town. It has very basic accommodations for 40 yuan per night. Food is provided at cost (you’ll eat with Aluo, his wife Joanne, and her mother who potters around the house weaving traditional Tibetan garments). There are no hostels in these three main towns in the valley, but some of the hotels are relatively cheap (ie, 80 to 150 yuan for a good, comfortable, modern room). My only advice is to try and book through C-Trip (not an ad, you can just save decent money through it), and to make sure the hotel you are booking accepts foreigners. Many hotels will have no rooms cheaper than 300 yuan (US$55), so if you’re not careful, the prices can escalate. Arriving really late to Fugong, I went to a hotel I’d booked on the bus, only to be told they don’t accept foreigners. I was forced to wander the streets at midnight in search of a hotel, and had to pay 250 yuan to stay at the Lijiang Hotel, at the southern end of Fugong, which was the only one open. In general, don’t worry about finding accommodation: there are lots of options in each town, none of which seem to have any internet presence. Just rock up and try your luck - you won’t be without a roof over your head, but you will likely have to pay more than you’re used to if backpacking. The major towns of Liuku, Fugong, Gongshan and Bingzhonglou all have a bunch of restaurants: a lot of delicious Tibetan food, fresh bread in the mornings, fruit stalls and small supermarkets. In Dimaluo, make sure you bring some of your own food and water (I didn’t, it was a hungry, thirsty few days). There is no store in town, and while Aluo’s Guesthouse provides really nice meals for breakfast and dinner, you won’t be able to take them on the trails. How to: Get a Chinese Visa in Bangkok, Thailand.